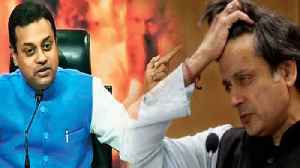 ▶ Videos for "Hindu Taliban"
Bharatiya Janata Party (BJP) national spokesperson Sambit Patra slammed Shashi Tharoor on his comment that &quot;no good Hindu&quot; would want a Ram temple at the dispute site of the..
Senior Congress leader Shashi Tharoor on Wednesday sparked a fresh controversy amid the ongoing row over his Hindu-Pakistan remark. Muslim parties staking full claim to the disputed Ayodhya site told the Supreme Court on Friday those who demolished the Babri Masjid could not claim ownership and said the act was the handiwork of..
No law or the Constitution allows the destruction of religious structures of any faith, senior advocate Rajeev Dhavan, appearing for the legal heirs of M Siddiq -- one of the original litigants in the.. The special bench of the Supreme Court headed by Chief Justice of India (CJI) Dipak Misra has fixed July 20 as the next date of hearing on the Babri Masjid-Ram Janambhoomi case. Around 150 artists from all over Rajasthan including Padma Awardees staged a protested against the Rajasthan government for unlawfully altering the constitution of Jawahar Kala Kendra (JKK) the art and..